The developers at Respawn Entertainment don't think single-player is popular enough to justify the costs. Titanfall is a game with jetpacks, parkour, and giant mechs, and the internet is consequently abuzz with excitement. The footage we've seen thus far has shown some intense multiplayer action, but talk of a single-player story mode has been notably absent. The simple explanation for that fact is that there is no single-player; Titanfall will be online only. "We make these single-player missions that take up all the focus of the studio, that take a huge team six months to make, and players run through it in eight minutes," says Respawn co-founder Vince Zampella. "And how many people finish the single-player game? It's a small percentage. It's like, everyone players through the first level, but five percent of people finish the game." For Respawn's crew of 60-something heads, those numbers just don't add up. "You split the team," Zampella says. "They're two different games ... but people spend hundreds of hours in the multiplayer experience versus as little time as possible rushing to the end [of the single-player]." Zampella's pragmatic use of development resources may upset solitary gamers who wanted a slice of the action, but it's probably wise not to overspend when dealing with a relatively small studio. Titanfall will have some story elements, but it will unfold over the course of the "multiplayer experience." And let's be honest, the appeal here is the mechs and jetpacks - a sweeping narrative probably isn't necessary. 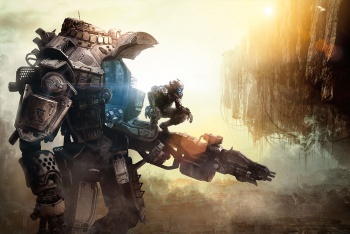 Titanfall is due to launch in spring 2014 on Xbox One, Xbox 360, and PC.